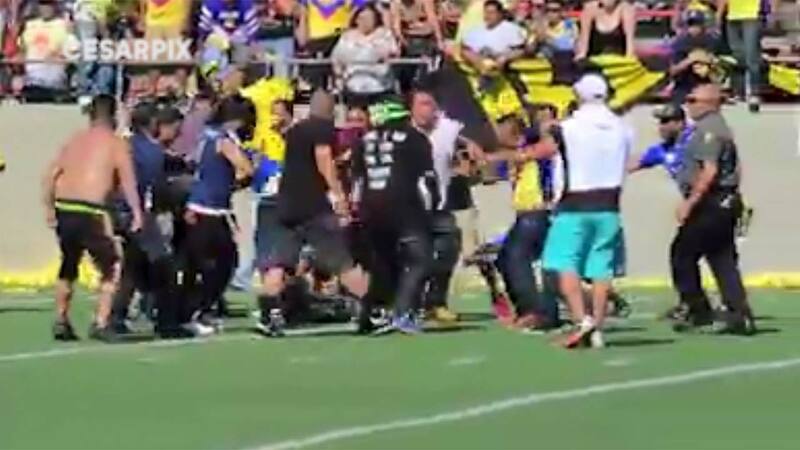 A friendly weekend game in California between former players of two professional Mexican soccer clubs turned violent during halftime when dozens of fans rushed the field. SANTA ANA, Calif. -- A friendly weekend game in California between former players of two professional Mexican soccer clubs turned violent during halftime when dozens of fans rushed the field and brawled. The Orange County Register reported the "game of legends" Sunday between former Club America and Pumas players was a benefit for the Santa Ana-based United Soccer Talents Foundation, which supports soccer players. Santa Ana police Cmdr. Jeffrey Smith said about 50 fans descended from the stands after the first half ended and began fighting. Police officers cleared the field and stands. Five suspects were detained and the rest of the game was canceled, Smith said. Video showed some fans repeatedly kicking one man who was down on the field. Better known players at the game included former Mexican national team members Luis Roberto "Zague" Alves and Alberto Garcia Aspe, Paraguay's Salvador Cabanas, Chile's Fabian Estay and Colombia's Andres Chitiva. Club America led 2-1 at the half. The rivalry between the Club America and Pumas is intense in Mexico. Video of the fight was shared over 4,000 times on Facebook.